At The Plough, we have a policy of continuous improvement across all of our services. To help maintain our high standard we would be pleased to receive feedback about your time spent with us. Please add the date of your visit. Please tell us why you visited The Plough. How would you rate the following out of 5 (5 being excellent, 1 being poor)? 1 2 3 4 5 Please select. Are our facilities up to standard, is there anything we need to improve? What two things did you enjoy about your experience with us? - Please Select -Browsing The InternetOnline Booking AgentEmailPublished AdvertRecommendationStayed PreviouslyTourist Board Please select one. We take your privacy very seriously, and will NOT share any of your details with any other party. Your details will only be used to email you news about The Plough. Prize subject to availability and is not transferrable and has no cash value. Prize cannot be taken on Bank Holiday weekends, special occasion days such as Mother’s day etc. and throughout December. Prize cannot be used in conjunction with any other special offers. Prize value is for a meal for 2 and does not include drink or menu supplements. Prize will be valid for 2 months from the date of issue. 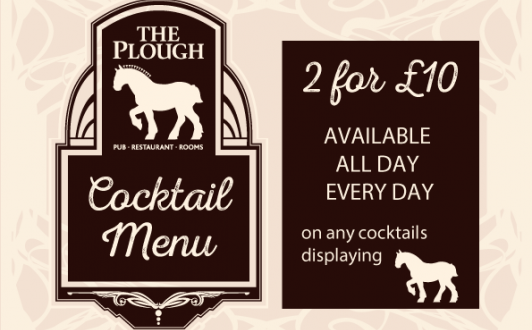 The Plough Cocktails...find your favourite! Please note dogs are not allowed in after 5pm on a Friday & Saturday. © The Plough 2019 | Website by Betton Design | Design by Adverset Media Solutions | Photography by David Chalmers.